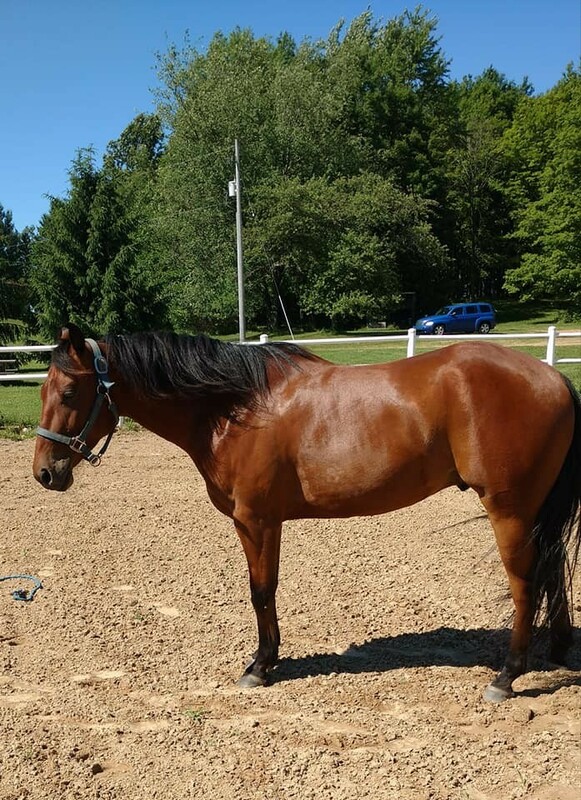 Whiz Olenas Lark, aka Brego, is a quiet, talented and extremely intelligent 4 year old gelding with unlimited potential to take you where you want to be! Not to mention he is one of the sweetest horses I have had the privilege of being around. Always comes no matter what kind of yummy snack he is munching on and is always ready to be pulled out and brushed or ridden. He just loves the attention! 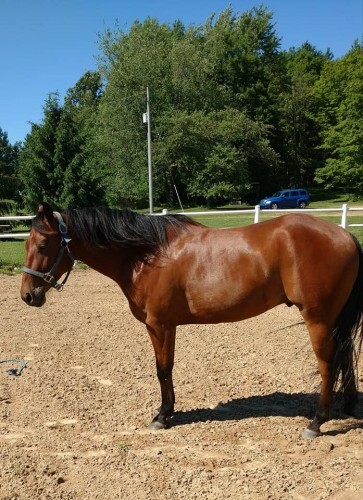 Has been under saddle for about a year and had 60 days under Marlin Holroyd in northern Michigan. He has a very solid foundation, you just need to decide how you would like to finish him up. He has a beautiful jog, side passes, legs yields at the walk and trot (working on the lope), pivots on the hind and forehand, simple lead changes, steers with leg or neck reins, pretty extension, does showmanship, great ground manners, doesn’t move a muscle for mounting/dismounting, cross ties, trailers, baths, you name it! Good whether he is ridden multiple days in a row or if he has had over a week off. He has such a joy for life and it’s evident in how he behaves and lives. In the pasture he will be grazing then decide to lope around just for the joy of loping, and then he will get down and roll back (he seriously is athletic and talented) and it is a sight to watch. Has been trail ridden several times and has done really well! Trailered him out once for a big group cancer ride of about 30+ horses and he did well. Does any trail obstacle I have set up in the arena (bridge, gate, poles, etc.) Stands great for the farrier, vet, chiropractor, massage therapist, etc. I have also been working a lot on the ground with him and he can come to a whistle pretty successfully and work off your shoulder nicely. For a young horse he is extremely brave and has a level head on his shoulders, but is still learning about life and all it has to offer. Would recommend a place where he gets adequate outside time, because he just genuinely loves it! Currently goes out most of the day and stalls at night and he does great with that. Only vice is that he does crib, but I just keep a little cribbing collar on him and he does great! I also truly believe Brego is a horse that needs a job and something to simulate him mentally, because he simply has so much to offer and that is what he loves. The only reason I’m selling this beautiful guy is I’m going to Veterinary school and simply cannot afford him while I’m away. Not to mention he has too much potential to just sit around. UTD on shots, worming and coggins. Asking $4800. A good home is a MUST. I want to find the best fit possible for this sweet boy, because he deserves a great home. Feel free to contact me with any questions! Thanks!